ilan: Hi there! I've actually been having some thoughts about this since I was analysing a joseki with 17K players on KGS, and they were mentioning the "influence" one side got, and I realised that I had almost no idea what that concept meant. The fact that players more than 10 ranks weaker than me were using it meant either that there is a huge gap in my understanding, or that they are reading too many books and using terminology that they have no hope of understanding until they improve about 15 or 20 ranks. My conclusion is that it was a combination of the two. In fact, I do understand some things about influence. 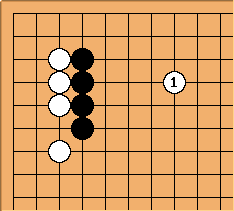 In this example, the power of Black's wall allows him to lift his stone off the edge like some unseen force. On the other hand, I have lots of problems understanding the influence you mention in your section. Basically, I see that most josekis are about one side gaining territory, and the other building a wall, and that it is up to each player to either immediately neutralise that wall, or immediately use that wall. I think that it's because of all the games I've played on Korean servers, where no one has read any books about influence, and they will routinely invade any area independent of how much influence is supposed to be there. On the other hand, I believe that the bad problem with most of the players on KGS is that they have read too many theory books, and just take for granted that you shouldn't play too close to thickness and don't learn how to fight around it. In essence, I guess I am disagreeing with you, and that until you get a more global sense of the game, you should just fight, fight, fight. Alex Weldon: It's an age-old argument, whether it's better to read lots of books, or just play lots of games. I think a balance is in order. While I agree that all theory and no experience doesn't make for a good player, I think that all fighting and no theory makes it harder to improve in the long run, since you develop the kinds of bad habits I'm trying to caution against. I also disagree that KGS players have lots of theory and no fighting skill. They have atrocious style. It's just that IGS and the Korean servers are even worse. The only players I've seen who have better style than fighting skill are people I've played at clubs - the Internet seems to bring out the ugliest play in people. I'm also not sure I'd call your diagram "influence." I'm not sure what to call it, but it seems too local and tactical. Influence is more of a strategic concept. You also shouldn't confuse influence with thickness. While it's bad to play near thickness, playing near your own influence can be good, if that influence was thin and you're making it thick. 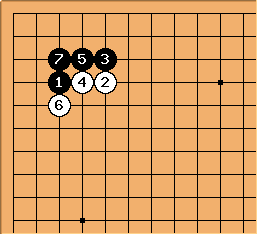 Such plays are usually shape moves or honte. ilan: OK well, I guess I really don't understand influence at all, which is why I wonder whether it is useful to explain it to people who are many ranks below me. Anyway, here is another example of what I see on Korean servers, as opposed to KGS. A number of people have played this and I feel that it is not such a bad move, and probably superior to playing a genuine joseki that you don't understand at all. This is because this unusual move was played by natural feeling, instead of being a memorised joseki, and so the player has some understanding of it. In general, improvement will come by developing this natural feeling for the game and trusting it even if it is unusual. 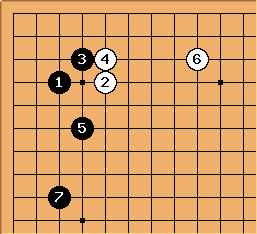 For this reason, I have started using the attach and extend joseki a lot more, and I have found it much easier to understand than the other responses to the 4-4 approach. For some reason, it is considered too simple by a lot of people (I recall you said you didn't like it) so played either by beginners, or by really strong players. Alex Weldon: My problem with the attitude you describe (and it's one I see a lot) is that it is more concerned with winning games than improving. You might win a few more games by avoiding situations you don't understand, but how will you ever come to understand them if you keep avoiding them? For instance, the attach-extend joseki is fine in some circumstances, and usually won't lead to a big disadvantage, even in the situations where it isn't the best, so you could probably get pretty close to shodan even if that was the only joseki you ever played in response to someone approaching your hoshi. However, it would be hard to compete at dan level if you kept playing it in circumstances when it wasn't appropriate. When you reach the level where it really holds you back (and if you're not there yet, you will be soon), you'll start wishing you experimented a bit more, so you had more options. When someone plateaus at a certain rank and can't seem to improve anymore, it's usually because they've become set in their ways and will need to move away from comfortable patterns if they're going to get any better. I just wish someone would write a book like this for me. I don't know what recurring mistakes I make that prevent me from improving, except the psychological problems that make it hard for me to concentrate. ilan: Oh well, I guess I won't be improving either. What your idea brings to mind is a classic chess book Chess Master Vs. Chess Amateur by Max Euwe. In it he analyzes games where one player is a enormously stronger than the other, typically games from simultaneous exhibitions or the early rounds of big swiss tournaments. In each game the loser makes one or more strategic errors and is punished in an instructive fashion. If I recall correctly he has an amateur co-author who asks all the dumb questions a reader might ask, though that may have been a rhetorical device. The book was very popular. There are at least two sequels by other lesser authors. I think you've misunderstood my suggestion. What I meant was that instead of analysing games between two weak players, try to find games where one player is much stronger. Chess has has the advantage of there being a lot of games played where the strong player has essentially no thinking time and is playing purely on "shape" (to steal a go term). This is why Euwe book is so instructive: the loser is never out-thought. In fact one of the (less instructive) sequels is of games where the amateurs win (typically by out-reading the master in otherwise ugly positions). Alex Weldon: Ah, okay. I took your comment as just a "oh, that reminds me of..." not a "you should try..." There is some merit in the idea, in that the mistakes will actually be punished in the game, instead of me having to point out how they could have been. On the other hand, it will be even harder to find examples where the position wasn't hopeless to begin with. Might also be harder to find examples in the first place, since people tend to play against their own rank more often than not. I suppose I could use examples from my own teaching games - especially since that's where I first started noticing these habits - but that would seem hopelessly egotistical of me. And, of course, the moves I come up with in post-game analysis are always better than the ones I find in the actual game anyway... I wouldn't want to imply that the moves I play in actual games (especially against a weaker opponent) are the type you'd want to emulate. Bill: After White's stones are stronger than Black's. After , is a good extension. But now Black needs another play to cover his weaknesses. 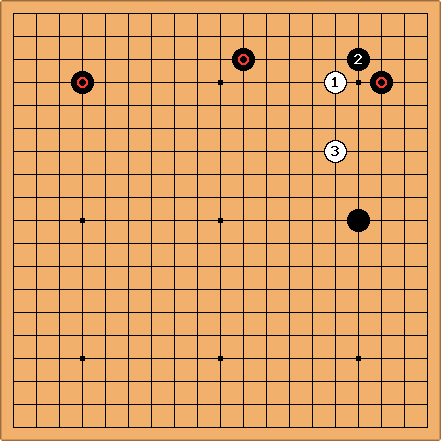 Bill: Compare that with the joseki here. Black has a large and secure corner and keeps sente. 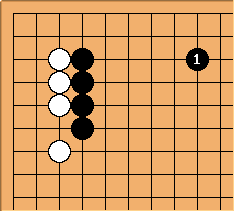 ilan: Rather, compare with the joseki here in which beginner Black, who wanted to avoid complications and steer things away from book moves, is now in over his head. Bill: One way (among others) to avoid the nadare is with at . Then hane on the side White does not extend on. tderz We could compare the moves - with a lot of situations. 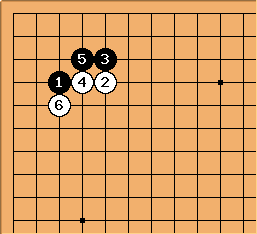 In the Chinese fuseki it makes sense for White to stay light, hence or some similar jump to reduce the influence (standard). I think there is no compelling argumentation without taking the rest of the board into account. Dieter: This is your first example in do not use thickness to make territory. 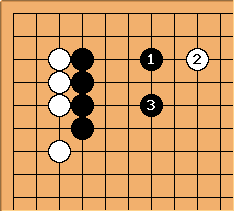 In itself I think it is conceptually flawed, because Black's wall cannot be called thick IMO. In fact, with one move, Black's wall is already under attack. A group which comes under pressure after only one move cannot be thick. 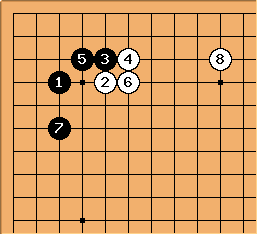 The wall, however, does have a lot of influence, so that White's attacking stones will not easily become strong themselves. In order to provide some eyespace for his wall, Black has a good move at , in order to enhance his influencial wall to a thick group. Now it will be difficult for White to attack it. In summary, I think the reference diagram is not suited for the discussion of the proverb. It could be suited to discuss influence versus territory or how to extend from a wall. Calvin: The example seems a little contrived. Does it come from a game? I do make this mistake, but it is more often in the center than on the sides where extension rules of thumb are well known and the methods of driving your opponent's weak groups to thickness are easier to grasp. Usually a poorly considered omoyo strategy exhibits this problem better. The later examples are more believable than the first diagram.